Alston is a former teacher and coach from Ohio who has spoken to students and staff at more than 6,000 U.S. campuses in addition to businesses and other organizations. He is the author of the book “Be the Best” and his website is built around that theme. His presentation Monday was part of a staff development program. Denair welcomes nearly 1,400 students back to its six campuses tomorrow at 8 a.m.
Rosander showed a popular “Shift Happens” video from YouTube comparing educational, population and technological trends from around the world to remind his staff of the rapid pace of change confronting students and those responsible for teaching them. Alston compared the revolution sweeping education to a roller coaster ride. “You get to the top and someone changed the rules and regulations from last year.” He talked about how technology is transforming the classroom — with laptops and tablets given to students instead of books, satellite teaching and online access to community college courses, and expanding charter school opportunities. 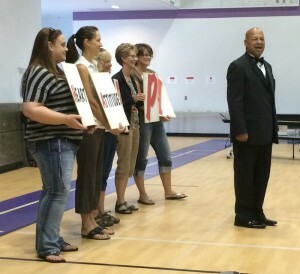 He had five employees hold cardboard signs to spell out “Happy,” then explained a message behind each letter. Alston’s presentation hit home with his audience. Veteran teacher Curtis Wooten called the speech “very uplifting.” He has worked in the district for 18 years and will teach independent study this year at Denair Charter Academy. “You have to keep a positive attitude every day,” he said. Alston warned against allowing students, schools or districts be burdened with negative labels. Another speaker is scheduled today. Pat Hurley, a three-time Emmy winner and one of the nation’s leading comedians for teens, will give presentations at 9:30 for middle school students and 10:35 a.m. for high school students. The public is welcome to attend. 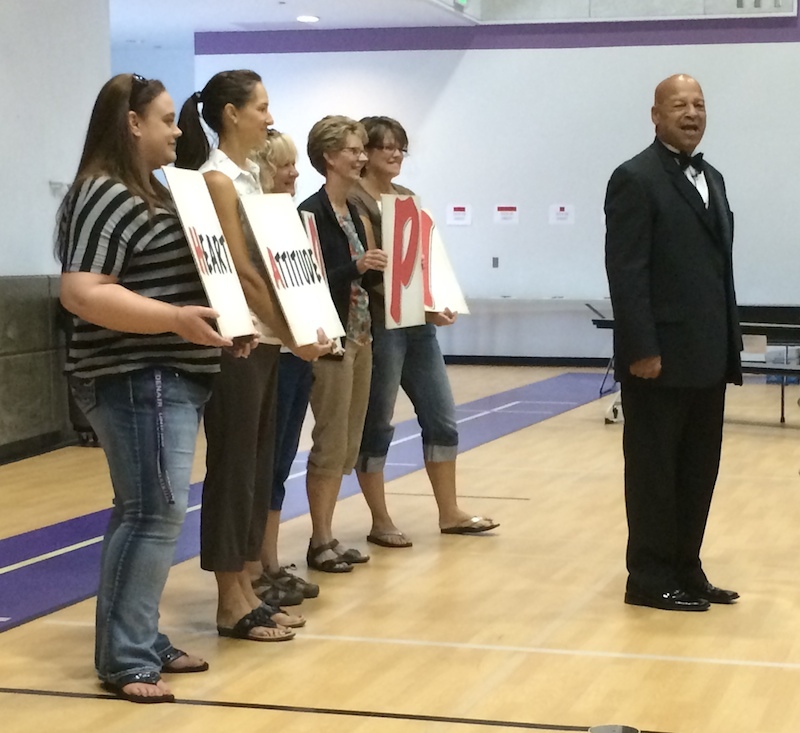 Posted in News and tagged Denair Unified School District, Hervey Alston, Motivational Speaker, Shift Happens. Jerrilynn Waller Pierce liked this on Facebook.